The overwhelming response to my two articles on Information and Communications Technology (ICT) in Papua New Guinea, from both within the country and abroad, shows the urgent need for the country to improve its ICT in this rapidly-globalised world. I was overwhelmed by the responses to my articles in The National on Friday September 7 titled “Building your own website” and the one last Friday titled “Internet cafes and the digital divide”. This week, I’d like to share with the readers of this column, some of the many responses to my articles over the last two weeks. I was inundated by the constant stream of SMS text messages and emails from people, particularly small business men and women wanting to build their own websites, as well as those complaining about the very high Internet usage fees being charged in PNG. A good friend of mine built his own website free of charge after reading my first article without having to pay exorbitant fees for a website designer, a domain name, or Internet Service Provider (ISP) rentals. It was a dream come true for this friend of mine, who has been trying for years to have his own website, only to be met with the brick wall of high costs. A handful of individuals and small business men and women are now in the process of building their own websites, while I am advising several others all over the country how to build their own, without being ripped of by unscrupulous companies and individuals. Second-year Divine Word University IT student Julia Komoru commented: “We have completed a unit on website developing recently, and it’s not at all difficult to create a website. Last Friday’s article on the very high Internet rates in this country, particularly those being charged by ISPs in Port Moresby at their cafes, brought back a swift and emotional response. I particularly compared the high rates by charged by Data Nets and Datec to the low rates being charged at the RH Hypermart and the Sports Inn. “The piece that caught my eye was your basic comparison between our Cafe pricing (as an ISP) and those at the Sports Inn and RH. “The question that is asked is ‘Why are our prices much higher than your favourite places i.e. Sports Inn and RH? other goods whilst they are on the Internet. Datec general-manager Tony Westaway wrote: “I read with interest your article in the National on Friday 14 September 2007. “You talked of a need to develop and expand the ICT industry and the country keeping in touch with world standards. “You mentioned that students need to be educated on the potential of ICT. “Datec is holding a Technology Expo over the 12th and 13th of October 2007 at the Crowne Plaza Hotel in Port Moresby. “We will have a significant number of International exhibitors in attendance. “It will provide an opportunity for business people, IT specialists, and most importantly students, to see the most recent developments in Information & Communication Technology. “Datec has already distributed over 1000 free tickets to students in technical colleges, UPNG and TAFE, and other institutions in Port Moresby. An anonymous reader wrote: “Internet access in PNG is much more expensive than you probably realise. “For example Datec charges K100 for 80MB Wireless Internet access. “In New Zealand KOL charges K100 for 10GB or 10,000MB Broadband Internet access. “That is, PNG is 125 times more expensive! Further the speed is considerably slower! “My understanding is that these ridulously high charges are because of the ridiculously high charges Telikom charges Datec and other ISPs. Sam Roth wrote from Japan: “Thanks for keeping us informed on the development of ITC in PNG, especially with Internet. “I have a good collection of your latest articles on IT and am quite pleased with your work. “Keep up the good work and know that you have fans all over the world. Sam signed off with a quote from Einstein: "Among every impossibility lies an opportunity." Being a regular user of Internet cafes in Port Moresby, it quite surprises me that cafes owned by Internet Service Providers (ISPs) charge among the highest rates. For instance, Data Nets charges K5.50 for 15 minutes, K11 for 30 minutes, and K22 for an hour. The country’s largest ISP provider, Datec, charges K10 for 15 minutes, K15 for 30 minutes, and K20 for an hour. Rates charged by major hotels in Port Moresby vary but can be quite astronomical. Compare these to the low K3 for 15 minutes, K6 for 30 minutes, and K12 for an hour being charged by the Comserv café at the RH Hypermart. Closer behind is the café at the Sports Inn which charges K6 for 15 minutes, K9 for 30 minutes, and K12 for an hour. 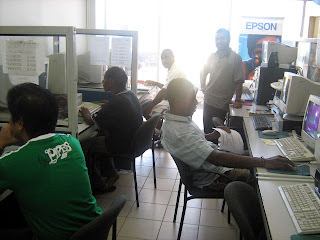 I regularly haunt the RH Hypermart as it has arguably the best and cheapest Internet café in Port Moresby. In theory, Internet cafes should be making the Internet affordable and accessible to the general public, however, they seem to be going the other direction in this country, making the Internet unaffordable and inaccessible. High Internet costs are a major setback for Small and Medium Enterprises (SMEs) who don’t have Internet access, as they use these cafes to try and sell their products and services. It is also a turnoff for tourists, students doing research, as well as members of the general public as they try to check their email as well as surf the Internet. Talk about trying to create a knowledge-based economy! I have heard many complaints from tourist friends about the very high Internet usage fees being charged in Papua New Guinea. Perhaps Telikom and the ISPs in this country should look at countries like Singapore, who have very-efficient and cheap Internet services. Anyone who’s passed through Singapore’s world-famous Changi Airport will tell you that you can access the Internet for free all around the terminal buildings. The hotel I was staying at in Singapore last month offered free Internet services. Strolling through the streets of Singapore’s Geylang district, I was able to use the Internet at one of the many such roadside cafes for about S$2 an hour. I was also able to talk to my wife in Port Moresby over the Internet – Voice over Internet Protocol (VOIP) – for only S$1 a minute. High Internet costs contribute towards making the much talked about Digital Divide in Papua New Guinea an enormous barrier to the ability of the people to participate in and benefit from the digital economy. Affordability – Can underprivileged small businesses and individuals afford to use quality computers and Internet services? Internet access – Are there wide band communication networks accessible to businesses and households both in urban and rural areas? 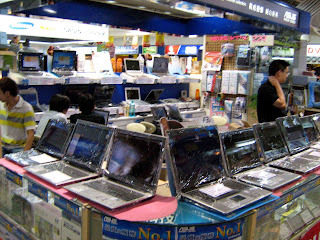 Personal computer penetration – Are personal computers economically owned by the underprivileged demographic groups? Training – Are there training programmes of computer and Internet provided to underprivileged sectors of the population? Relevant content – Are there relevant software packages, local language contents rich enough to address the needs of the underprivileged population? IT sector – Are there efficient ICT industries who are able to serve the needs of local businesses and individuals? On Wednesday last week, I attended a seminar organised by the PNG Computer Society, being someone who is very much interested in ICT. Society secretary Sadiq Ali said as PNG gradually developed its economic and political sphere, there was an imperative need for the ICT industry to develop and expand in the country. “PNG, although it is not apparent it is suffering from a need of advanced communication industry, the country needs to keep touch with world standards of information systems and networking,” he said. “Costly as it may seem, the investment will do good to match the first-rated countries and furthermore, the future generation of this nation will be the ones to make use and improve on this. “Coming from an educator’s angle in ICT, PNG needs to educate its younger generation on the potential of the ICT and the good it will do for the economy. “Students need to be educated on the new technology and innovation so that they too become independent thinkers and networkers. Meantime, I was overwhelmed by the response to my article in The National last Friday titled “Building your own website”. I was inundated by the constant stream of SMS text messages and emails from people, particularly small business men and women, wanting to build their own websites. They concurred that companies and individuals are benefiting from the ignorance of the little people by charging them huge amounts of money to build a website for their small businesses. And after being ripped off, the little people then feel the brunt of paying excessive fees for a domain name, regular rental to the ISP, as well as Internet usage fees to Telikom. The response to my article highlighted, at least to me, the need for training programmes of computer and Internet to be provided to all sectors of the community, particularly our SMEs. Several companies and individuals in Papua New Guinea are profiteering from the ignorance of our little people by charging them huge amounts of money to build a website for their small businesses. And after being ripped off by these companies, the little people then feel the brunt of paying excessive fees for a domain name, regular rental to the Internet Service Provider (ISP), as well as Internet usage fees to Telikom. In a small economy such as that of PNG, small businesses cannot survive with such exorbitant costs. This should no longer be the case, as it is quick and easy to design a website using templates freely available on the Internet, where you do not have to pay for a domain name or ISP rentals. Your just have to pay for your Internet usage fee at the nearest Internet café if you don’t have Internet access in your office. More often than not, these small PNG business men and women, are not Internet-savvy and will not know basics like uploading their website onto the Internet or registering their website with Internet search engines and web directories. The situation for many Small and Medium Enterprises (SMEs) all over the world, including PNG, is that an entrepreneur owns a small or medium enterprise. Goals – What do we wish to achieve through E-marketing? Resources – What resources can we expect to support our actions? Actors – Who are the marketing actors in the E-marketing process? Spaces – Where will our E-marketing take place online? Actions – What specific E-marketing actions should we take? Outcomes – What outcomes should we expect from our E-marketing activities? Competing on the Internet is different because it is highly fragmented and holds more than 8 billion web pages. Traffic to a website – How many hits, unique visitors? Product purchase – How many visitors buy the product? Brand excitement - How many visitors write about the product and tell others? Repeat visits – How many visitors come back to buy more? Existing resources should include the website and staff. Do you have a marketing budget to attract more customers to your site? Do you have a technology budget to build a better website and other digital services? Actors’ orientation towards the company will be friendly, agnostic, or hostile. The important decision is should you create your own website or go through a platform? When you create your own website, it is hard to build awareness and traffic, and is a risky investment. On the other hand, it is not a sure bet to go through a platform, and you must share revenue with the platform. Making a free website these days is fast and really easy, which is certainly good news for SMEs all over PNG. Government departments, statutory organisations, non-government organisations, sporting teams, provinces, villages, families, individuals, and many more should also be looking at seriously building their own website if they don’t already have one in this rapidly-globalising world. Each of our 109 MPs should have their own website to share information with their voters and the people of PNG. 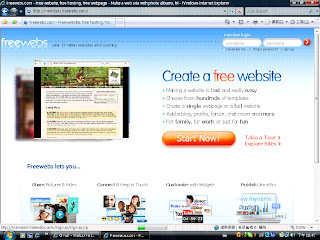 You can also create your own online Blog – which basically is an online diary - free of charge in which you can broadcast your views to the whole world. I have my own Blog http://malumnalu.blogspot.com/ in which I feature some of the stories I have written about PNG and I have received response from around the world. You can also send short video clips to YouTube, one of the most-popular and fastest-growing websites in the world, free of charge. Many world leaders, including Australian Prime Minister John Howard, use YouTube to broadcast their video clips. All over this increasingly-globalised world, a massive Information Revolution is taking place as economies use Information and Communication Technology (ICT) as a passport to what economists call the “New Economy”. The digital divide within PNG is an enormous barrier to the ability of the people to participate in and benefit from the digital economy. Small and medium enterprises, the backbone of the PNG economy, must be prepared with ICT knowledge. If they are not ICT-savvy, they will not receive the benefits of globalisation and they will be left behind the rest of the world.